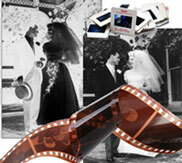 If printing from 35 mm negatives this can be done directly. providing they are in strips of 3 or more. This will not produce a digital image to keep. Other format copying may be available, please ask for more details.